These heavy-duty reels have a rigid hard plastic case and lobster-claw hook on one end and a J hook on the other. They attach to any jacket and annual ski pass or other credentials, and come with a heavy-duty nylon cord with a reinforced ring to reduce cord breaks. 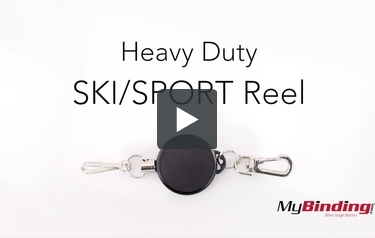 This is the Heavy Duty Ski/Sport Reel! It has a swivel hook to securely attach to any of your passes. Notice it’s not necessarily easy to get on—which mean it won’t fall off either! I didn’t have my winter coat, but you can see that the lobster-claw hook attaches nicely to my zipper. And my belt strap—there you go! Both sides of the reel are the same, and the cord is a heavy duty nylon. The lobster-claw swivels nicely so you have easy access to either side of your pass. Also, with any of our lanyards you can give us a call and talk about custom stickers. Lastly, the cord is 24 inches in length.